How do we map our Milky Way galaxy? The image above shows a representation of our Milky Way galaxy as we think it appears. The blue region indicates the range of stars visible with the naked eye, and the the white dots represent the location of the 118,200 stars precisely measured by the Hipparcos spacecraft. The points represent the best data we have on stars in our galaxy. Since Hipparcos there has been a less precise Tycho catalog of about 2.5 million stars, and the recently launched Gaia spacecraft will precisely map about a billion stars. 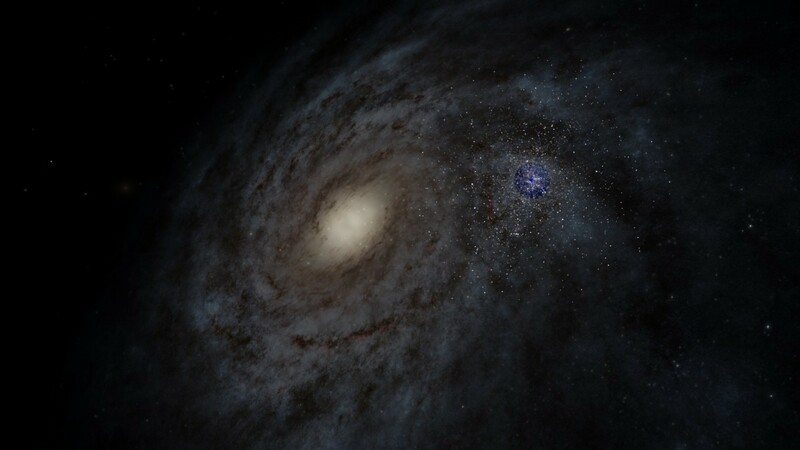 But even Gaia will map a small fraction of the estimated 100 – 400 billion stars in the Milky Way. 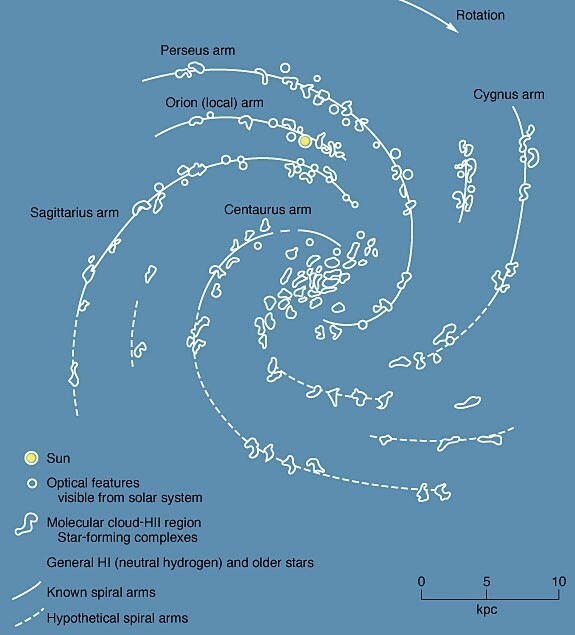 Most of the stars are simply too dim to be seen at galactic distances, or are hidden by the cloud-obscured zone of avoidance toward galactic center. So how is it that we are able to know what our galaxy looks like? Although we can only observe a small fraction of the stars in our galaxy, there are other objects such as nebulae that we can observe. In particular, there are star-forming nebulae known as H II regions, which contain large amounts of ionized hydrogen. In the visible spectrum these regions are often seen as red nebulae, but the hydrogen also gives off radio signals at a particular wavelength of 21cm, which is why its often called the 21cm line. Since radio wavelengths aren’t absorbed significantly by the gas and dust in the Milky Way, much of this 21cm radiation is visible to us across the galaxy. As a result, we can map the locations of these H II regions. From this we find that our galaxy has a clear spiral structure to it. In particular, it is a type of spiral galaxy known as a barred spiral. While hydrogen is by far the most abundant element in our galaxy, the 21cm line hydrogen emits is not particularly strong, so it can be difficult to observe at times. Fortunately, there are other wavelengths we can observe, such as carbon monoxide emission lines, which are much brighter. From all of our observations, we have a pretty good idea of the size and structure of our galaxy. The artistic renderings of the Milky Way you often see are inspired by images we have of other similar galaxies we can observe such as Andromeda. We know what barred spiral galaxies look like, and our own galaxy likely looks pretty similar. It’s actually amazing how far we’ve come in only a century, given that it wasn’t until 1918 that Harlow Shapley was able to determine the basic structure of our galaxy.